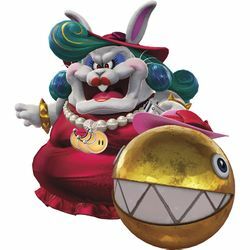 Madame Broode is the boss of the Broodals, a group of evil, rabbit-like wedding planners appearing in Super Mario Odyssey, which are hired by Bowser to plan the wedding between Peach and himself. Madame Broode is an obese female rabbit with hair alternating between turquoise and blue that curls at the ends who wears a red dress and hat, resembling Pauline's concert clothes, and a pearl necklace. She is found in the Cascade Kingdom. She is also the ruler of Rabbit Ridge in the Dark Side of the Moon, though is never seen there. In the fight, Madame Broode attacks Mario with her golden pet Chain Chomp (referred to as Chain Chompikins) which he has to control with Cappy. When controlled, Madame Broode tries to catch him with her hand, getting tired after a few swipes. The player should then move away from her and pull to wind up, allowing him to send it flying at her after releasing to score a hit. Madame Broode will then send Chompikins spinning at Mario. After a while or when she gets hit by him that Mario controlled using Cappy, she uses the spin attack again. By sending Chain Chompikins flying at her, Mario scores the next hit. However, when Mario takes control of Chain Chompikins, Madame Broode will try to attack Mario to get him out and he must wait for her to tire before he can yank the chain. After each hit, they drop sixteen coins; and after the third hit, they are defeated, disappear in a cloud of smoke, and leave behind a Multi Moon. She is fought a second time in the Underground Moon Caverns in the Moon Kingdom, where she attacks Mario out of revenge for both her earlier encounter with him and his defeat of all the Broodals. This time, Chain Chompikins wears three top hats, five in the last phase, and Madame Broode attacks more when Mario takes control of the chomp, but the fight is otherwise unchanged. After this encounter, although she does not appear in Rabbit Ridge, where each of the Broodals are fought, it is possible to fight her again by re-entering the Underground Moon Caverns. As a side note, Madame Broode has many similarities to Bowser, such as general design, particularly in the muzzle shape and spiked wristbands, as well as the fact that she uses her face as a figurehead for the Broodals' airship and the RoboBrood, while her minions somewhat invoke the Koopalings. Despite being the Broodals' boss, she is never seen interacting with them. Wanwan-chan 「ワンワン」(Wanwan, also the Japanese onomatopoeia for a dog barking) is the Chain Chomp's Japanese name, while「ちゃん」(chan) is an affectionate honorific. As the boss of the Broodals, Madame Broode shares several traits with them, but is somewhat different in a number of ways. Unlike them, she has her own battle theme (though it's a remix of the original Broodal boss theme) and the Broodals' intro music does not play at her encounter. Her Chain Chomp's collar resembles that of a Chain Chomplet. When Madame Broode throws her Chomp, it resembles a yo-yo trick called "Walk the Dog," while Chain Chomps are known to act like dogs. She is the only boss in the game not to have an edited post-game rematch. However, she can still be re-fought at any time in the Honeylune Ridge caves. This page was last edited on February 24, 2019, at 19:42.